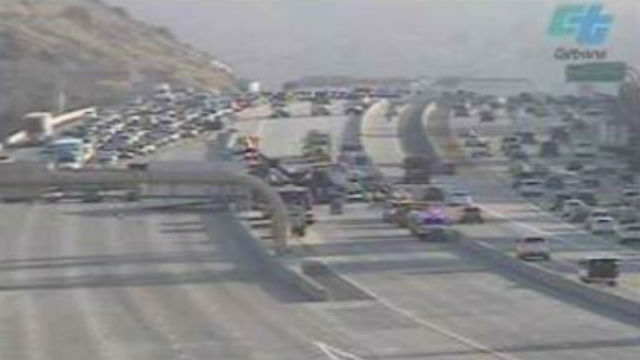 Caltrans camera shows crash on I-15. A tractor-trailer loaded with furniture overturned and caught fire Thursday morning on Interstate 15 in Mira Mesa. The big rig hit the center divider and rolled onto its side in the southbound carpool lanes near Mira Mesa Boulevard around 4:20 a.m., according to the California Highway Patrol. The driver made it out safely. The crash prompted a closure of the HOV lanes and two other southbound lanes. The truck was righted and all lanes were reopened by 8:45 a.m., according to Caltrans.